the regular prices posted on our web site at http://www.kiseidopublishing.com/go_equipment.htm . These items are available only from Kiseido's head office in Japan. in Japanese yen at the current rate of exchange. 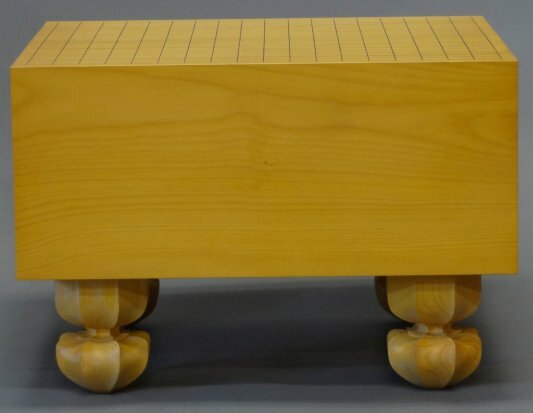 The board being offered here has the highly-prized tenchimasa grain (straight grain going across the top and bottom with straight grain going from the top to bottom on the sides facing the players). Tenchimasa is the preferred grain pattern of go-equipment connoisseurs. This particular board has a small discoloration in the upper left quadrant of the surface (see image on the top right). There is also a discoloration on one of the sides where the tree was struck by lightning (see image on the top left). For these reasons, this board is being offered at a discount. Other images of this board, showing its other surfaces are available on request. 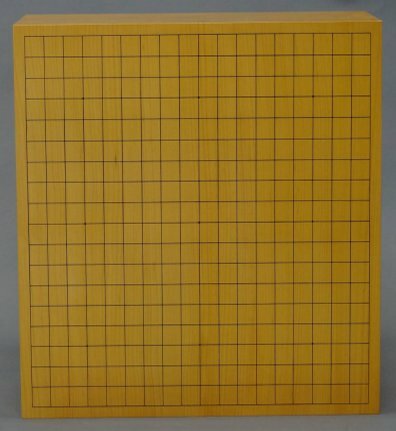 This board is a beautiful golden yellow. The tree from which it was cut was harvested in the 1970s in Okayama Prefecture, Japan. 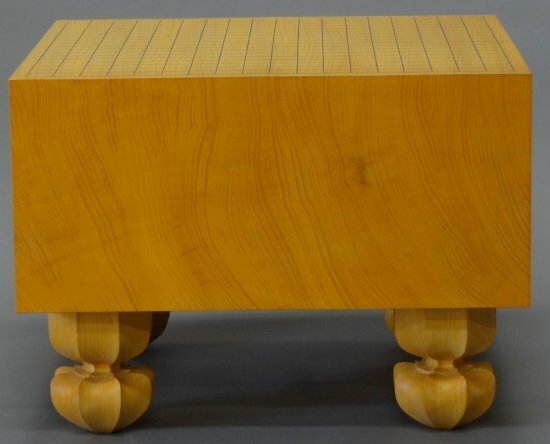 It has been standing as a finished go board in the artisan's store room for about 40 years, so it is well seasoned and, with proper care, there is no danger that it will crack or warp. Airmail shipping and insurance are included in the price. If you wish to purchase this board, please consult with our head office in Japan by email at kiseido61@yahoo.com. This 6-cm thick table board is made of five pieces of kaya, cut from the same tree. The highly-prized masame grain runs straight across the top. 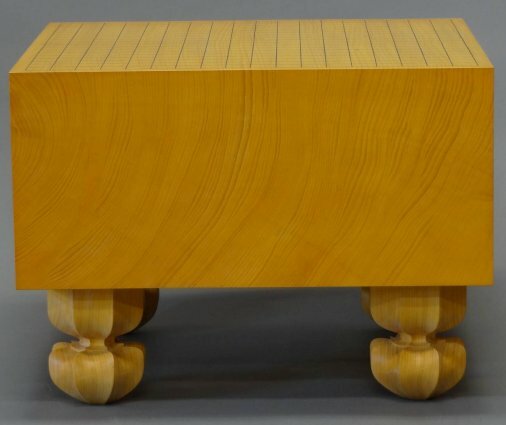 It has a natural finish with a subdued golden yellow hue that highlights the grain. Add 10% for airmail shipping. Airmail shipping is included in the price. To order any of the above sets of stones, please consult with our head office in Japan by sending an email to kiseido61@yahoo.com. Note: Besides thickness, the white stones are classified into two grades: yuki and jitsuyo. Yuki stones have many grains which run straight across the top. Jitsuyo stones have either irregular or indistinct grain lines. For the regular prices of other grades and thicknesses, please go to Kiseido's go-equipment page at http://www.kiseidopublishing.com/go_equipment.htm. As can be seen from the image below on the left, keyaki is a beautiful wood whose golden brown color is an excellent match with the color of kaya boards. These extra large bowls will hold up to 11.3mm-thick stones. Chinese quince is a wood with a rich dark color (see image above on the right), similar to the island mulberry bowls, but not as expensive. 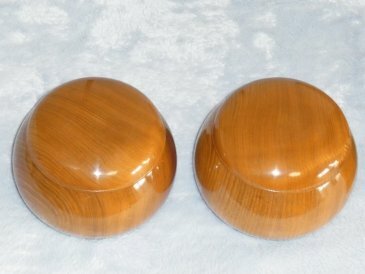 These bowls will hold up to 10.1mm-thick stones. 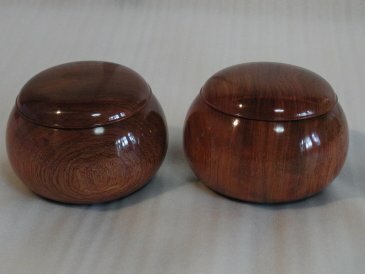 10% for airmail shipping will be added to the price of the above bowls. The finest mulberry bowls are from trees harvested on Mikura Island However, a volcano erupted on neighboring Miyake Island a number of years ago, so the trees there can no longer be harvested. 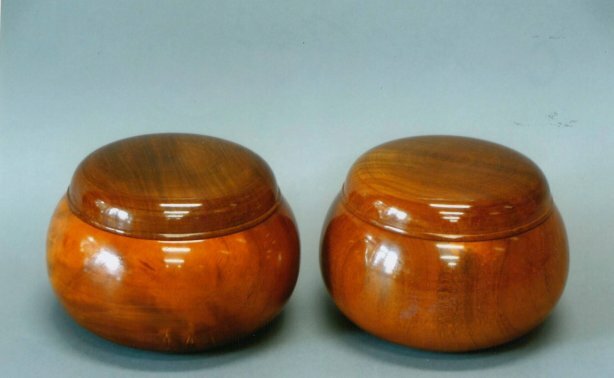 Bowls from Mikura Island are highly prized by go-equipment connoisseurs. They have a reddish hue and one of their most appealing characteristics is that they glisten and change color, highlighting various grain patterns, as they are tilted in the light. 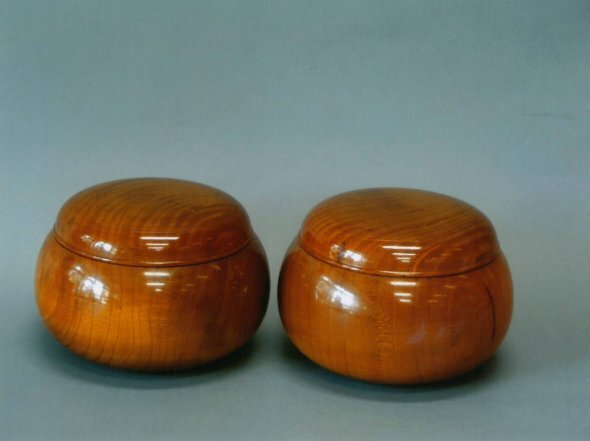 Kiseido has access to a supply of the Mikura Island bowls crafted by Tagami Sukeshiro, a famous artisan, designated as a Japan National Treasure, who specialized in making bowls used in tea ceremony. His "nom de plume" was Yoshiaki, the characters for which he carved on the back of each bowl he made. He died in the 1990s, well into his 90s. 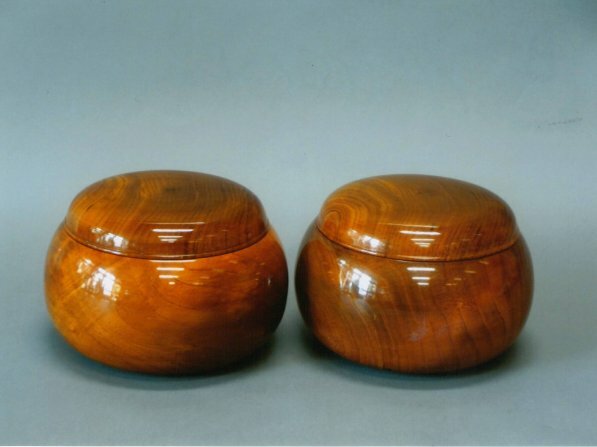 Below are examples of some of the bowls he carved. Photos of others that are available can be provided on request. Shipping charges are included in the price of Mikura Island bowls. Payment can be made through PayPal in US dollars. You may access Kiseido's account through our email address: kiseido61@yahoo.com. at the prevailing exchange rate.